This little project came to me this past weekend by way of my FLGS owner. While us Old Timer's were playing out Round 3 of our campaign, she stopped by and asked me if I would be willing to help out with an upcoming silent auction to benefit the Race for the Cure. Like I'm going to pass up an opportunity like this. Of course I said yes and after a few emails back and forth, I came up with what I thought might help raise a little money for the auction. It seems like a number of our local players field Blood Angel armies and so I thought this guy would be perfect as a tribute to their favorite army or maybe a new game piece. The model is the Blood Angel Vanguard Veteran Sergeant and he's mounted on a display base from Secret Weapon Miniatures. It's no secret I enjoy using misterjustin's products. I've had this display base for some time now just waiting for an opportunity like this to come along. As far as base related prep work, it's the standard resin fare. Cleaning model lines (of which there were very few) and washing it clean with warm soap and water. I did take a small sander to the bottom of the plinth and the sides to get a super smooth finish. Always, always wear a face mask when sanding resin pieces, The stuff is really bad for you and you don't need to be inhaling any of the dust. And go outside while you sand too, don't do in your house! This is my first plinth (mount, display base, whatever you want to call it) and I'll tell you, it's like painting a second model. There's a good bit of work that goes into these guys. It's not my best results, but I did learn a few things by doing this one that will help me next time. There are no conversions on the model since I wanted to get him done as quick as possible. I cleaned the mold lines using my trusty file, primed him light grey (since he would be red) and got to work. I only snapped one WIP shot while I was painting his armour. 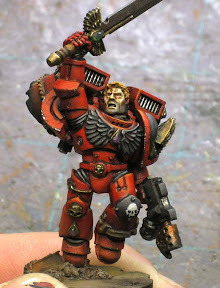 I was moving along at a good pace and figured I would explain how I paint red in another post later this week maybe. Besides, this guy got the royal treatment when it came to painting if you couldn't tell. The shot was taken around the time I started adding the cool tones to the armour. He started out primed light grey. 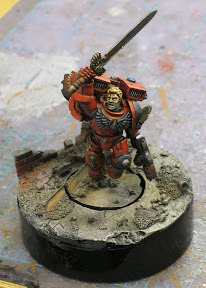 The basecoat is two thin layers of GW Foundation Mechrite red followed by a thin wash of Baal Red. Then I broke from what I normally do to try some new things. I went in with Thraka Green and shaded the deep recessed areas on the model first. After that, I took Asurmen Blue, thinned it slightly and kept adding layer after layer in the shaded areas on the model. Using a zenith highlight approach, I kept toning down the portions that wouldn't have seen any light from directly overhead to give them a cool look as opposed to the bright warm look of the highlighted areas. 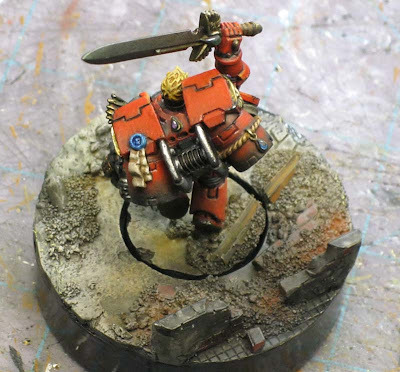 With the shading done, I went in with my bright red craft paint and added the highlights to the armour. It takes a few layers to get a nice bright highlight since it's a semi-transparent red. This is a double edged sword. It's good because I can blend the highlights much easier and it's bad because it takes about a half dozen passes to get a pure color. I tried to add as much detail to the model as I could without going too crazy. I highlighted the few black areas there are on the model and didn't just give them a quick line highlight. I tried to go the extra step where I could. I used the GW version as my guide and painted mine to look like that minus the color of the gems. Here is a better shot of the figure. When I tilt him into the light, you can see more of the work that has gone into him. I painted his eyes in place, this being the second model I've done this on. I also gave him some 5 o'clock shadow too. I'm quite proud of the blending on his left knee. It came out fairly well I think. That and the little skull is the icing on the cake. The weathering (at least the chipped paint) is done with a sponge initially and then I went back in with a brush and added silver to the larger areas to simulate it going down to the metal underneath. Even though I was copying the GW version for my color scheme, I still went in and made some adjustments. As I highlighted objects, I tried to keep my brightest highlights up towards the top of the model and even more so near his face to bring focus to that area of the model. Sitting here looking at the pics now, I can see things I might fix if I were to keep working on him. 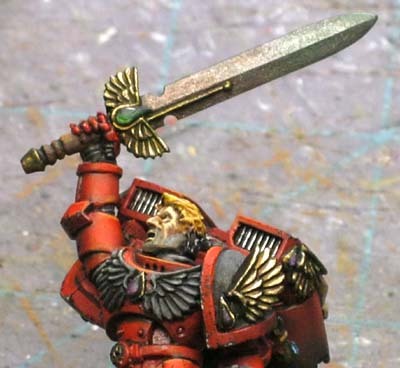 And the final pic shows the change in colors on his power sword. It took about six passes with Ogryn Flesh towards the hilt and one pass of thinned Thraka at the top to get the transition. It just adds a little more color to the model. The gold has a fairly unique look to it too. It's one of my "test" methods. I start with a Dark Angles Green basecoat. On top of that goes Blighted Gold from P3. I'm not too worried about covering the whole thing with the gold either. If some green is left showing, that 's fine. 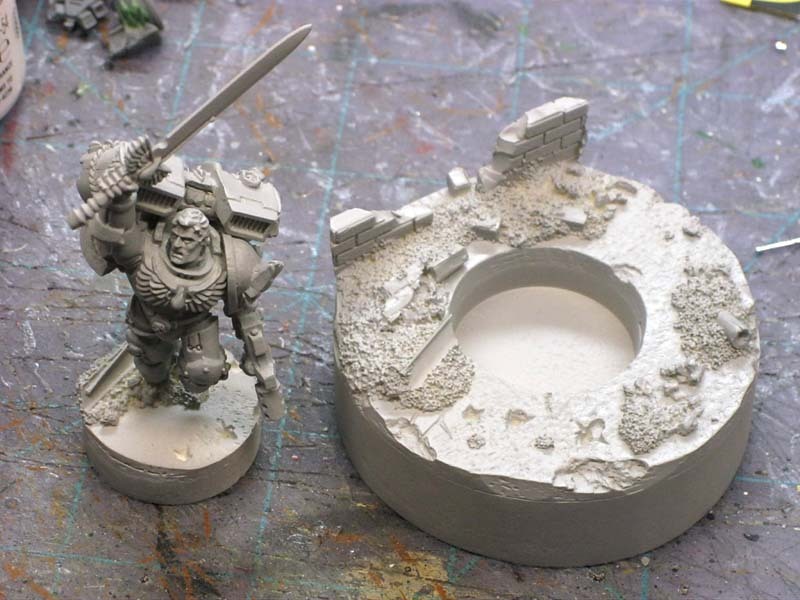 It gets a wash of GW Devlan Mud after that to add some warmth and really darken the shadows. Once that's dry, I go in with a bright silver and add my highlights keeping in mind my light source. A final wash of GW Gryphonne Sepia turns the silver into a bright, warm gold for the final effect. Sometimes I'll make two passes with the Sepia color if need be. The final effect is a worn out gold that hasn't exactly been kept clean over time. I think it's fitting for the 40k universe and my darker style of painting. I did manage to sneak in some smaller details like the correct iconography on his shoulderpad. Or at least I think it's right. 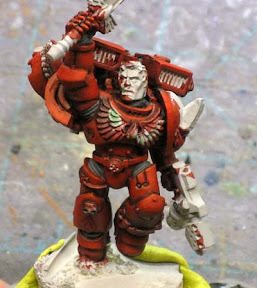 I had to look through the Blood Angels Codex to see what kind of images these guys sport being Vanguard troops. Turns out it's the same thing from his left knee. Easy enough that was. I also added a small "danger" red line to the fill level on the hand flamer. If you go back up the post to the pic that shows his left side, you can almost make it out on the weapon. And last but not least, the base. I probably should mention how the base is painted. Since it starts out primed the light grey, I work from that without adding any more of a basecoat to it. I start with some washes of dark grey, black, some blues and browns and work them into the whole thing giving it some variety. Once that dries completely, I'll go in and pick out the odd colored things like bricks, pipes, etc. When those are done, I blend them into the base with more washes. Then it's a few highlights by way of drybrushing a light grey on some areas for contrast. Last but not least are the weathering powders. I have a bunch I picked up from Secret Weapon that I use more and more frequently these days. I didn't use too many here, just a couple shades of brown on the base along with the lower portion of the model to tie them both together. It's an added touch that brings some realism to the model and creates that environment for him to come alive in. I think I've covered everything in this monster post, but if I missed something, drop me a comment and I'm gladly explain how I did it. great job Ron, reallywell painted. I hope it raises a good amount for the charity! I think it did. I know the whole thing raised a good amount overall, but I never found out how much this little guy netted. 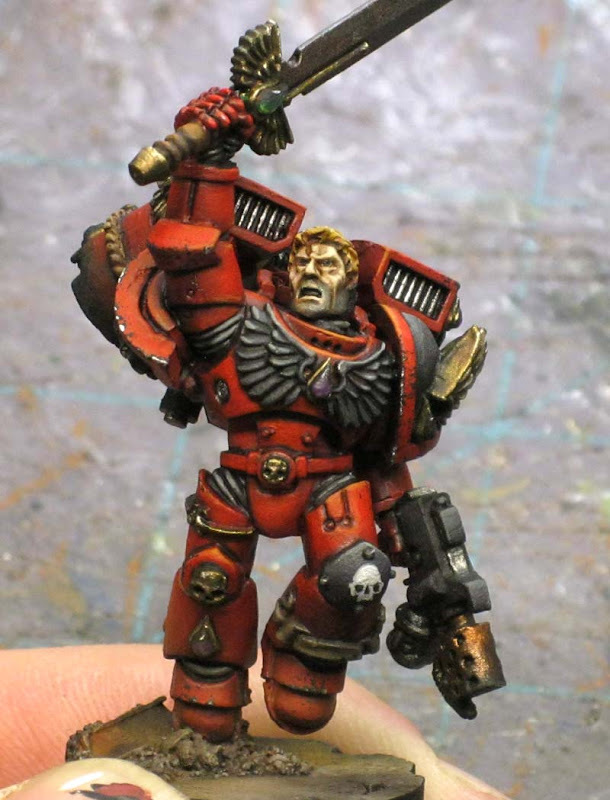 Where did you find this miniature? or was this alot of custom green stuff work? 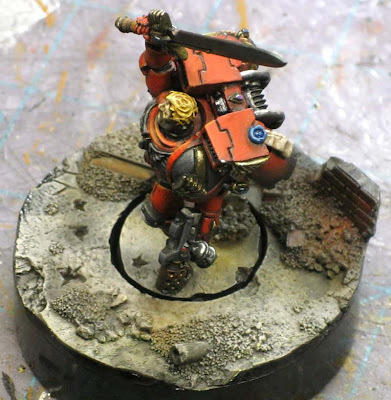 Fantastic miniature! Evicerator: Would you believe he's 100 percent stock. That's the way he comes. He is added to a Secret Weapon base... that's the only upgrade I gave him.